Five Great Episodes From S.W.A.T. : SEASON 1 – Schlockmania! Jungle War: Bo (Cameron Mitchell), an old war buddy of Hondo’s, talks the brass into letting him be a temporary stand-in when Deacon gets injured. Unfortunately, he’s a trigger-happy hothead who puts the entire team in danger with his “kill ’em all, let God sort ’em out” attitude – and when Hondo pushes back, it ignites an old wartime rivalry. Mitchell beca me famous with b-movie buffs for his hammy performances in films like The Toolbox Murders and this role offers an early preview of those theatrics. He rants, raves, picks fights, shoots crooks in cold blood – in other words, he’s a ton of fun to watch. The tension between his hambone theatrics and Steve Forrest’s old-school underplaying approach to acting gives their showdowns a real spark. Time Bomb: when Street goes back to a movie set to retrieve a piece of equipment forgotten during a training exercise, he and his date find themselves in the middle of a plot by a bitter ex-stuntman (William Smith) who is planting bombs so he can hold the studio for ransom. Street has to get word to the rest of the team while dodging the stuntman and his accomplices. This episode is basically one big chase studded with a series of showdowns so it delivers a high quotient of action and the movie backlot setting gives it some extra flavor. 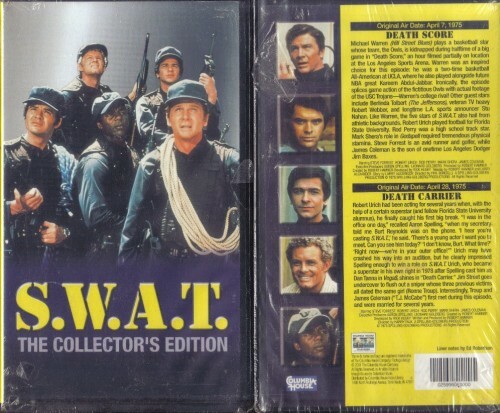 Best of all, Smith – in his b-movie tough guy prime here – makes a worthy adversary for the S.W.A.T. men. Note: Heather Menzies, the actress who plays Robert Urich’s girlfriend here, would later become his r eal-life wife. (note: technically, Time Bomb made its debut during the second season of S.W.A.T. but it is included here because it was shot during the first season’s production and held back. It appears on the DVD set for the first season). The Bravo Enigma: the S.W.A.T. team is assigned to protect a U.S. Senator. They don’t know that an international assassin (Christopher George) has been flown in to take down the Senator – and no one, not even the assassin, knows that he is infected with a highly contagious plague that could cause an epidemic. The results are no less comic book in tone than the rest of the season but the plotting is unusually sophisticated, with Herb Bermann’s script creating a number of near-misses that build tension as the team slowly realizes the stakes of their mission. Watching George swagger around in tough-guy style just adds to the fun. The Steel-Plated Security Blanket: when an armored car is hijacked, the S.W.A.T. team has to not only find it but also figure out how to defuse the situation if the thieves choose to use it in a crime. That’s exactly what happens when said thugs decide to rob a beauty pageant that is using some expensive jewels – and further complication is added by the fact that McCabe’s girlfriend is working for said pageant and thus ends up in danger. This is another ambitious episode, with the team having to figure out a tricky technical maneuver while the plot makes commentary in its own light way on the nature of beauty pageants. It also has a great guest-star cast: Lara Parker plays McCabe’s girlfriend, a pre-Charlie’s Angels Farrah Fawcett pops up as one of the pageant contestants and there is a grandly nasty performance from Michael Conrad as the brutal leader of the thugs. Blind Man’s Bluff: When Hondo suffers a bullet-grazing head trauma, it causes a brain injury that causes blurred vision and fainting spells. This condition forces him to step down from the S.W.A.T. team and face a new career of desk work – unless he takes a chance on a risky operation. This episode represents an intriguing departure from the show’s mission-driven formula, delivering what is essentially as close as this show would ever get to a Police Story-style psychological portrait of a cop’s life. It’s paper-thin in a dramatic sense and has a weird comic cameo from Rose Marie but Hondo’s dilemma – and his team’s concern for him – are oddly touching. Forrest, an underrated actor, does nice work with the simple drama here and the result offers a nice showcase for his old-school gravitas. 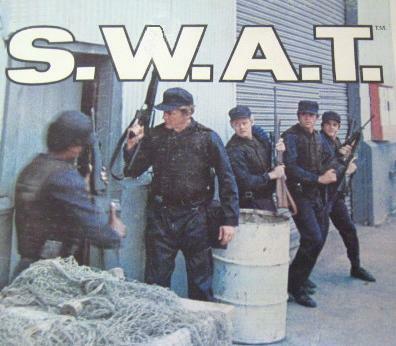 If you want to read Schlockmania’s review of S.W.A.T. : Season 1, click here. 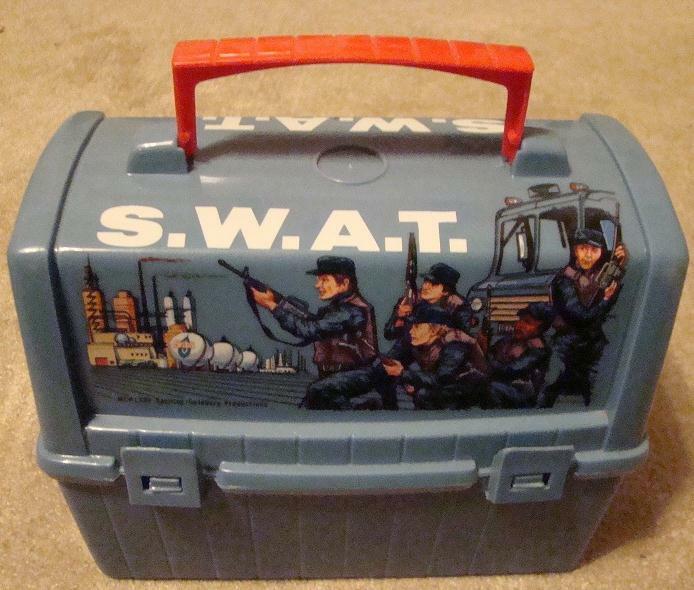 If you want to read Schlockmania’s review of S.W.A.T. : The Final Season, click here.